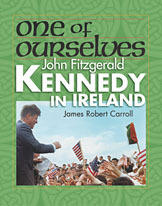 A fascinating and faithful account of President Kennedy's 3 1/2 day visit to Ireland in late June of 1963 – a day-by-day, hour-by-hour look at the places Kennedy visited; the people he met – political and cultural luminaries and average Irish citizens alike; the throngs who lined the roads to catch a glimpse of him or gathered to hear him speak; and the events that crowded his schedule. Exhaustively researched from written and oral sources, the book tells a memorable tale of the president's "homecoming" to a people and land long etched in his heart and at last on the verge of taking their place in the modern world's politics and economy. 44 photos. Extensive chapter notes, bibliography, and index. ABOUT THE AUTHOR: The author, James Robert Carroll, has been a reporter for three decades, covering Washington since 1983. His interest in presidents dates from his days as a teen-aged volunteer in presidential campaigns in the 1960s, and he has covered the administrations of the last four presidents. He has visited Ireland a half dozen times, written news and travel stories from Ireland for American newspapers, and reported from Washington on Irish affairs. Among other honors, Carroll has won awards from the National Press Club and the National Press Foundation. He is also the author of The Real Woodrow Wilson: An Interview with Arthur S. Link, Editor of the Wilson Papers. He and his wife, Carol Vernon, and their daughters Fiona and Brenna, live in Alexandria, Virginia.